With rapid hi-tech industries development and a much bigger growth potential compared to Europe, Indian market is very appealing for Russian businesses even despite its high challenges. Today’s India is virtually the only country in the world enjoying an impressive market potential combined with unique investment opportunities, according to a conference held in India as part of a visit by a delegation of Russian entrepreneurs. Russia’s Ambassador to India Alexander Kadakin pointed out that the country had long outgrown of its role as a “junior brother.” India is now home to modern technology and has a vast market potential. According to the Ambassador, the country spends some $30 bn annually on just software development, an area where experts believe Russia spends no more than $2-3 bn. According to Vladimir Evtushenkov, the Indian market is, even so, among the world’s most challenging, with business and risks always going hand in hand. “Whoever considers India as an investment opportunity should realise that there won’t be any immediate payback. The process will take between three and five years. However, if you are serious about building a business there, you have to understand that the country’s growth potential is bigger than a couple of dozen European countries’ put together”, Vladimir Evtushenkov said. Sitronics, a leading provider of telecom, IT and microelectronic solutions, has demonstrated that the Indian business community is interested in cooperating with us in these areas. As part of the visit, its subsidiary, Sitronics India, signed a memorandum of understanding with the Indian telecom company TechMahindra, part of the Mahindra group with $12.5 bn in annual sales and operations in 31 countries. The agreement is TechMahindra’s first experience of cooperation with a Russian company and provides for development of partnership relations to promote Sitronics products among TechMahindra clients in India and elsewhere. When asked about the extent of TechMahindra’s interest in doing business with Russia, Executive Director Jagdish Mitra said that Sitronics was bringing new products to the Indian market and that his company saw major prospects ahead. “Sitronics offers a good product, while we have vast capabilities to market them. This is an excellent combination”, Jagdish Mitra noted. Sitronics India Director Timur Vekilov explained that, under the agreement, Sitronics will act as an OSS/BSS solutions vendor and plans to offer TechMahindra clients the full FORIS product line, which consists of a converging billing and services management system, a roaming and partner settlement system and business analysis solutions. Remarkably, this is the first Russian company to act as a vendor in India. Until now, only European and Indian vendors have been working with local mobile operators. 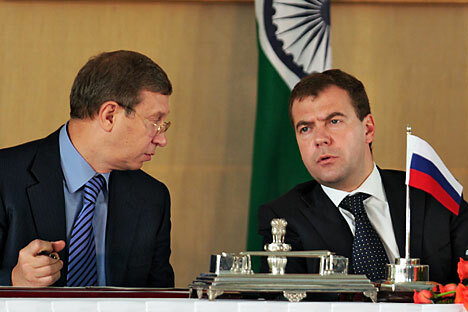 According to Timur Vekilov, this is not Sitronics’s only area of cooperation with Indian businesses. His company has entered into a cooperation agreement with the Indian transportation company SS Cabs. “At SS Cabs, Sitronics has implemented the NIKA system, a navigation solution meeting the transportation needs of small, medium, and big businesses allowing for real-time positioning of vehicles and analysing where and how a certain vehicle has been used”, Timur Vekilov explained. In the opinion of Sitronics India’s Director, this helps in streamlining corporate fleet costs and successfully planning and conducting the operations of a company with a vehicle fleet of any size. Another example of successful cooperation is SSTL, a joint venture between AFK Sistema, the Russian Government, and the Indian Shyam group of companies. SSTL markets its services in India under the MTS brand. Moreover, when MTS was just entering the Indian market three years ago, many Russian experts were rather skeptical. There are 14 mobile operators in India, with a monthly ARPU of just $2. According to the experts, the Indian market is very tough, with operators under constant pricing pressure. That said, MTS is not doing badly at all in this highly competitive environment. By offering its Indian subscribers one million free minutes in the initial stages, the company has been able to attract customers and build a client base. Aware that the golden age of voice services, whether in India or elsewhere, is behind us, MTS has embarked on a strategy to develop mobile broadband web access with voice service support. In addition, the company has marketed an offering bundled with a free smart phone. As a result, over the three years it has built up its business almost from scratch, it has created a mobile network covering the entire country and serving more than 13 million subscribers. SSTL has thus become the first big joint Russian-Indian business project on the local consumer market, as well as being vivid proof that our domestic business technology might still be successful outside Russian-speaking territory. Sitronics and MTS are now discussing joint projects. Plans include establishment of a competencies centre to design and develop products for the local market.